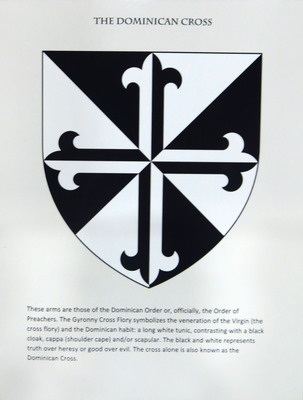 These arms are those of the Dominican Order or, the Order of Preachers. The Gyronny Cross Flory symbolizes the veneration of the Virgin (the cross flory) and the Dominican habit: a long white tunic, contrasting with a black cloak, cappa (shoulder cape) and/or scapular. The black and white represents truth over heresy or good over evil. The cross alone is also known as the Dominican Cross.